During the summer, many people enjoy the outdoor atmosphere at the cafe or restaurant at the Byward Market in the City of Ottawa in Ontario, Canada. 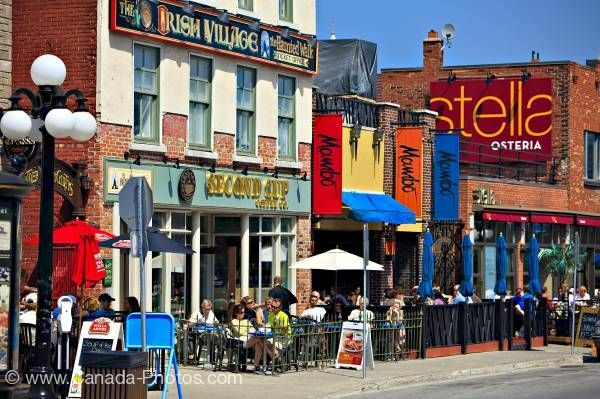 The cafe and restaurant at the Byward Market in the city of Ottawa, Ontario is very busy as people sit outside on the terraces and enjoy the sunshine. These cafes or restaurants give people an opportunity to sit and relax and enjoy a good lunch before continuing to shop around the market. The buildings are decorated with bright signs and billboards with old fashioned street lamps which tend to lure in more people as they catch the eye of the people visiting the market. There is a long list of cafes and restaurants, many local people prefer certain ones, while many like to try different ones to find their favorites. Picture of the people at the cafes/restaurants at the Byward Market in the City of Ottawa in Ontario, Canada. ... Approximately 50,000 visitors are found at the Byward Market in one weekend during the hot summer months.